The Train Bleu opened its doors in 1901. It is an "unusual restaurant" in Paris - Who could expect the Gare de Lyon railway station to host this great table upstairs, facing the rails ... A unique place to enjoy a traditional French cuisine - Compromise between a typically Parisian brasserie and a gourmet restaurant. 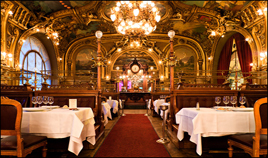 Andre Malraux granted the Train Bleu restaurant historical monument status in 1972 - The Belle Epoque decor is breathtaking (Sculptures and murals cover walls and ceilings) and the food refined ... The place definitely worth a visit either for a lunch or a dinner. A very unique place to eat in Paris. Coco Chanel, Brigitte Bardot, Jean Cocteau, Salvador Dali, Jean Gabin, Marcel Pagnol and many others have been regulars here. Please note that the information about Train Bleu restaurant was accurate when it was published, but can change without notice - Please check with the restaurant the accuracy. Some of the world's finest cuisine can be found in Paris. We have listed the best places to dine in Paris : Be sure you hit the best restaurants or the best bargains for food while you are there. Paris cafes are possibly the most well-known image of the City of Light.